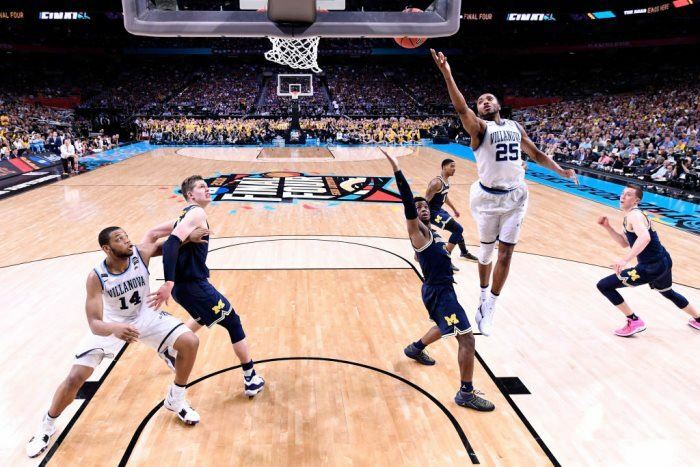 NCAA basketball takes centre stage from the NBA every March when an initial 68 Division 1 college teams are reduced to 64 colleges, who then compete in a winner takes all knockout tournament, appropriately dubbed “March Madness”. Alongside the televised on-court action is the yearly ritual of attempting to correctly predict the outcome of all the matches to achieve a perfect bracket of results. The mathematics behind March Madness is very simple, the outcome of all 63 elimination games must be correctly predicted. As an illustration of the difficulty of the task, we can assume that each of the 63 games are contests between equally matched teams and therefore the implied probability of selecting the winner of an individual match is 0.5. The cumulative odds to be overcome amount to 0.5^63 and the resulting probability is tiny. This figure is 1.1x10-19 and equates to odds of 9.2 quintillion to 1. The reality is that seeding and mismatches, particularly at the beginning of the competition, make selecting potential game winners easier than choosing between two equally matched teams. Matches where the favoured team has a 0.7 or 0.8 probability of winning will increase the cumulative implied probability of choosing all 63 winners, providing of course there are no upsets. However, even a strong favourite with an implied win probability of 0.8 will lose 20% of such games. Using the historical range of odds for the winners through each round of the tournament to replace the assumption of a coin toss, the odds that need to be overcome to be successful will likely be of the order of 1 in 2 billion. 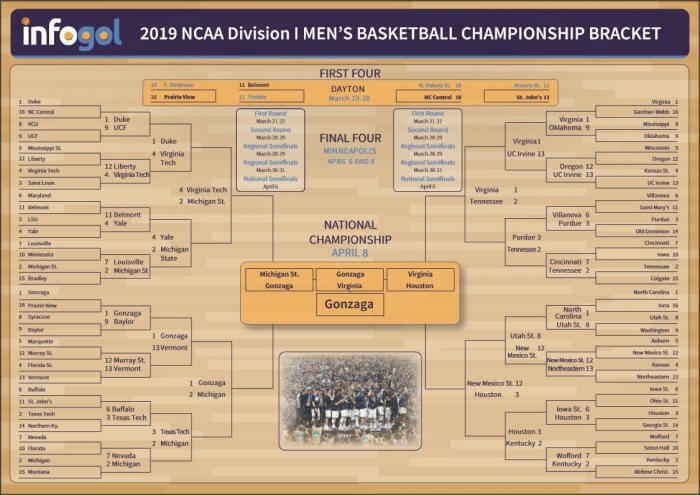 If devising the perfect bracket appears too daunting, then you are lucky, as the team behind the successful Infogol football app have created one for you. Individual matches also offer an array of traditional basketball betting markets. The simplest market is moneyline betting, requiring you to name the winning team in a game. This can involve mismatches, such as Boise State, outsiders priced at 7.00, against hot favourites, Nevada Wolf Pack at 1.14 or the more evenly matched Virginia Tech (1.87) against Florida State Seminoles (2.02). For those who are reluctant to take very short prices about perceived “certainties” or shy away from a longer priced outsider of two, a handicap market gives a start to the weaker side. This is known as betting with a spread. For example, North Carolina Central were short priced favourites at 1.17 on the moneyline against the 6.0 Delaware State Hornets. But if the Hornets receive a 10.5 points start, the odds move closer to 1.95 each of two, to reflect an artificially created, balanced contest. For those hoping to cheer every point or predict a low scoring contest, total markets, sometimes called overs/unders markets allow for bets to be made on whether the total points scored by both teams, including any overtime, end above or below a designated value. The North Carolina/Delaware game boasted an over/under market that was priced around 135.5 total points. Therefore, a total of 136 or more would be a winner for the overs and one of 135 or fewer points would be a successful unders bet. More typically in the NBA, so called proposition bets are offered on the performance of individual players. These markets may be framed around the total points, number of rebounds or assists or the number of successful three pointers a player makes during the game. Again, the bettor predicts whether the player’s performance goes over or under a pre-game value and these markets involve evaluating a player’s historical statistical record, along with the amount of playing time they are likely to get in the upcoming contest and the quality of the opponent. And finally, outright odds are always available for a side to win either their conference, division or an entire competition, such as the March Madness tournament or the NBA Championship.